THE Cultural Center of the Philippines (CCP) through its Intertextual Division celebrates the 25th anniversary of its literary journal by launching Ani 37, the Cleansing and Renewal issue, on November 29, 2012 at the CCP Promenade at five in the afternoon. Ani 37 contains 97 works of prose and poetry submitted by 66 authors written in English, Filipino and different Philippine languages, representing Aklanon, Bikol, Chabacano, Ilokano, Iluko, Kankanaey, and Pangasinan. “The prose and poems in this issue are metaphors of self-awareness and transcendence, and reflections on relationships with the Other, with mortality/immortality, with nation/country, with cultures local and international – and engagements with ideas on history, governance, civilization and consciousness,” wrote editor-in-chief and Intertextual Division chief Herminio S. Beltran, Jr. in the literary journal’s introduction. The Ani 37 contributors include: Conviron Altatis, Mark Angeles, Alma Anonas-Carpio, Billy T. Antonio, G. Mae Aquino, Carlos A. Arejola, Francisco Arias Monteseña, Mark Joseph Z. Arisgado, Abdon M. Balde, Jr., Maria Leah Baroña-Cruz, Ronald Baytan, Gil S. Beltran, Herminio S. Beltran, Jr., Kristoffer Berse, April Mae M. Berza, Letty Cantal-Pagkalinawan, Mark Gil M. Caparros, Nonon Carandang, Paul Castillo, Jose Jason L. Chancoco, Joey Stephanie Chua, Melchor F. Cichon, Mar Anthony Simon dela Cruz, Denver Ejem Torres, U Z. Eliserio, Johann Vladimir Espiritu, Raul Esquillo Asis, James M. Fajarito, Luis P. Gatmaitan, Genaro R. Gojo Cruz, Cristino Iloreta Inay, Sr., Io Mones Jularbal, Levine Lao, Junley L. Lazaga, Elyrah Loyola Salanga-Torralba, Nestor C. (Librano) Lucena, Elynia S. Mabanglo, Francis C. Macansantos, Maynard G. Manansala, Perry C. Mangilaya, Shur C. Mangilaya, Neoli Marcos, Donna Patricia Nuguid, Gexter Ocampo Lacambra, Wilhelmina S. Orozco, Melba Padilla-Maggay, Chuckberry J. Pascual, Honesto M. Pesimo, Jr., Ferdinand Pisigan Jarin, Lila Ramos Shahani, Vicente R. Raras, Rommel Rodriguez, Christopher S. Rosales, Hope Sabanpan-Yu, Scott Saboy, Louie Jon A. Sanchez, E. San Juan, Jr., Fely Senido, Jojo G. Silvestre, Priscilla Supnet Macansantos, Ariel S. Tabag, J.I.E. Teodoro, John Enrico C. Torralba, Betty Uy-Regala, Rachel Valencerina Marra, and Santiago B. Villafania. During the launch, some of the contributors will be performing their work. 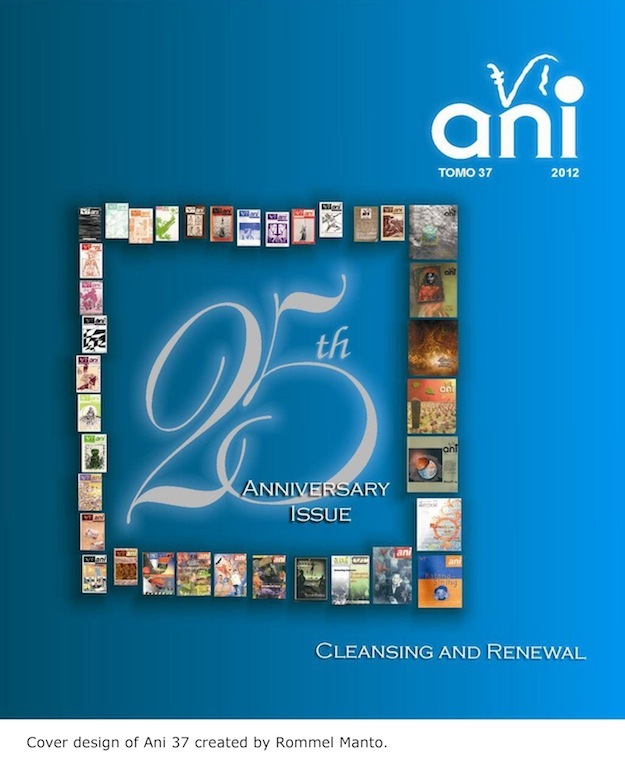 Ani 37 will also be sold at a discounted price in the mentioned launch.